Yeah, but: Quick, guess which country it's from. 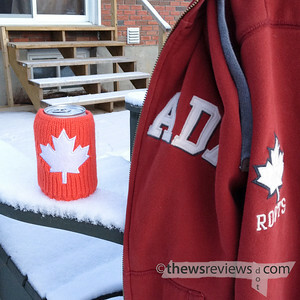 The Long Version: Humour counts for a lot, and The Drink Toque makes the most of it. 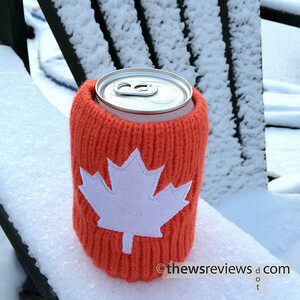 It's really just a can cozy, but it's knitted instead of being made out of the ubiquitous neoprene and foam rubber. It's perfect for lounging around in our typical Canadian weather. To compliment this fairly simple idea, there are loads of colours and patterns available, and they come in different sizes as well. Mine's a small, designed for 355ml containers, but it's a touch tall for the coke cans that I usually prefer. I don't suppose that it's an accident that the website shows them on bottles, but it's easy enough to snug down a touch. I doubt that these will keep cans as cold for as long as some of the more hard-core designs, but that's okay. Humour counts for a lot.